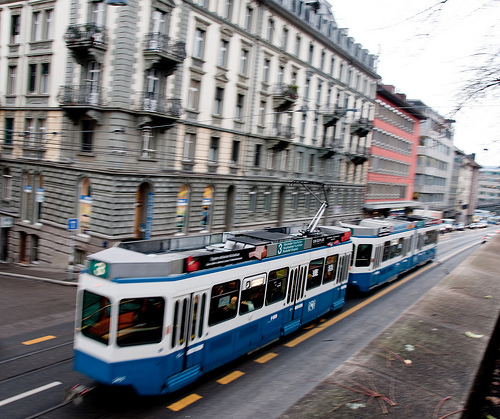 In Zurich, Switzerland, public transportation conveniently reaches out to most areas of the city. This network, owned by ZVV, is extremely popular amongst the residents. The ZVV vehicles actually have one of the highest rates of traffic density out of any transit network worldwide. Zurich’s public transit system is known to be very efficient, clean and safe. It is advised not to arrive late to any of the vehicles for departure, as they will leave right on the spot. Visitors should take note that they must buy a ticket before boarding, or else they will be fined if caught without valid fare. People can buy tickets from machines or from ticket vendors. The price of tickets varies according to how many zones the passenger will travel. The lines in this network run daily from 5:30 AM through after midnight. The ZVV website offers a map of the system’s transit network. Athletic types who want to explore the city of Zurich can also rent a bike for free, by providing an ID and cash deposit. The S-Bahn of Zurich is a commuter rail that connects all of Zurich’s suburbs, as well as some outlying regions. These trains offer fast, convenient travel to many different areas around this region. With the exception of the rural lines, all of the S-Bahn lines pass through Hauptbahnhof, the Central Station. The tram network in Zurich covers most of the city neighborhoods. This system currently has 14 operating lines that are color-coded. There are also two funicular lines, and two interurban light rail routes. Most of these lines pass through Hauptbahnhof, or at least provide transfers so it is easy for riders to get there. The city buses in Zurich cover many of the urban neighborhoods, and also reach far out into the suburbs and rural areas. Some of the buses run on electricity. The Zurichsee Schifffahrtsgesellschaft, or ZSG, operates boats that travel around Lake Zurich. Their services connect Zurich and its surrounding towns. There are also river buses that offer travel from the Landesmuseum through many destinations among the Limmat River. This river transit only operates during the summer months. Some of the Zurich boat routes are tourist-oriented, and developed for people to sightsee or learn history. Zurich is one of my top favorite cities in the world. GREAT transportation. Haven’t been there since 2004; will likely visit there this year. Hope to be there in summer, no where else I came to such a prompt public transit service as in Zurich, Switzerland. Pure joy!